TOP: Left to right are Emeritus Professor Scott Bowman, Professor Nick Klomp and Chancellor John Abbott. BELOW: Professor Nick Klomp. CQUniversity Australia has welcomed new Vice-Chancellor and President Professor Nick Klomp, who replaces the retiring Professor Scott Bowman in the role. Professor Klomp joins CQUniversity having previously held the role of Deputy Vice-Chancellor Academic at the University of Canberra. Prior to his time at the University of Canberra, Professor Klomp spent 20 years at Charles Sturt University, where his last role was as the Dean of the Faculty of Science, covering disciplines from agriculture to nursing and from allied health to wine science. Professor Klomp is also an internationally-recognised researcher in applied ecology and environmental science. CQUniversity’s Chancellor, John Abbott, welcomed Professor Klomp to the University’s top job and also paid tribute to Professor Bowman who held the role for a decade. “This is another exciting milestone for CQUniversity, as we welcome a brand new leader and bid farewell to Scott who was our longest-serving VC. “Under Scott’s leadership, we were able to achieve many remarkable feats and have grown significantly in terms of our physical presence and reputation. “We are now looking ahead to the next 10-20 years and at developing a new strategic direction that will build on recent momentum, while also differentiating CQUniversity within a very competitive sector. “I believe the University will fare extremely well under Professor Klomp’s leadership because he has shown that he has energy, enthusiasm, knowledge and expertise to drive continued growth and excellence,” said Mr Abbott. “During the recruitment process, Professor Klomp also showed that his personal values were in direct alignment with our university values and culture – something that is vitally important to everyone at CQUniversity. “I look forward to working alongside Nick, to ensure our university continues to deliver great things for our staff, students and communities,” said Mr Abbott. Professor Klomp said that he was delighted to arrive in Rockhampton and to get started in his new role. 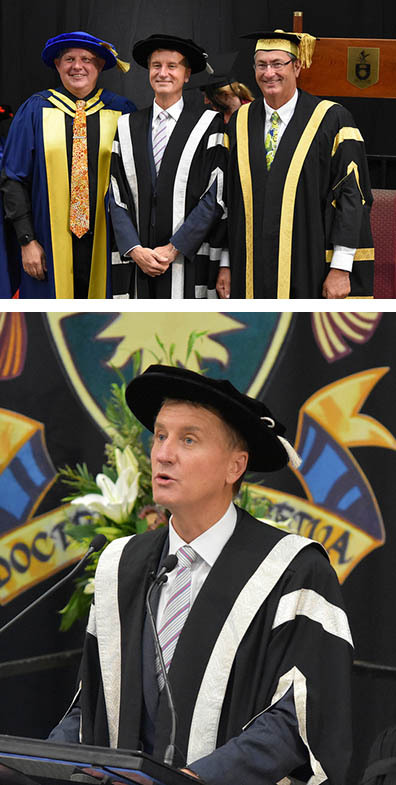 “I feel very privileged to be here as CQUniversity’s sixth Vice-Chancellor and President and to lead one of Australia’s largest regionally-based universities,” said Professor Klomp. “I have followed CQUniversity’s development in recent years and admire the way it has established itself as a university that collaborates and gives back. “CQUniversity has differentiated itself as an institution that is completely focused on making a positive and far-reaching impact on those it seeks to serve and that is something I really value and want to continue,” said Professor Klomp. “CQUniversity’s values of engagement, can-do, openness, leadership and inclusiveness, resonate with me and I can see that these values have led to the development of a very strong culture within the University. Professor Klomp was welcomed as Vice-Chancellor and President of CQUniversity Australia, during an official installation ceremony on CQUni Rockhampton North campus on Monday evening, 4 February. The ceremony was live-streamed to CQUniversity campuses across Australia.